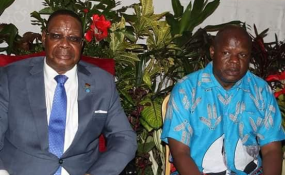 President Peter Mutharika and his running mate Everton Chimulirenji (file photo). People in the northern part of Malawi more than ready and also excited for their first ever presidential running mates debate in history scheduled to take place at Grand Palace Hotel in Mzuzu on Tuesday March 26 organised by private broadcaster Zodiak Broadcasting Station (ZBS). The euphoria comes at a time when Malawians are still applauding Zodiak for conducting exciting and successful Presidential Running mates' debates in Lilongwe and Blantyre respectively. Mzuzu-based Gift Maonga said he is looking forward to watch the live debate at Grand Palace Hotel saying he has been following all the debates through radio and television with keen interest and now he can't afford to miss the opportunity at hand. Francis Mapulanga concurred with Maonga by praising Zodiak for considering taking the debate close to the northerners. Running mates for governing Democratic Progressive Party (DPP) Everton Chimulirenji will not take part as the party continues to boycott any debates for the elections. Those expected to be panellist include Mohammad Sidik Mia (Malawi Congress Party-MCP), Frank Mwenifumbo (United Democratic Front-UDF) and Michael Usi of UTM Party. Speaking in an interview debate organizing committee chairperson Raymond Likambale said people in the North should also expect one exciting debate. He therefore advised those who have accessed invitation cards to be sited at the venue by 6:00pm in the evening saying considering the invitation cards distributed, the venue will be packed and the debate is slated to start at exactly at 6 o'clock. Organisers said the dress code is formal and that party colours will not be entertained. Meanwhile, Media Institute of Southern Africa (Misa) Malawi is also organising debates for selected presidential hopefuls starting on March 29.